Alejandro Falla hits a forehand return during his match against Gilles Simon on January 2, 2013. Falla saved six set points in the second set to post a 7-6 (7/1), 7-6 (12/10) victory over Flavio Cipolla in the first round of the ATP Tour’s SAP Open on Wednesday. 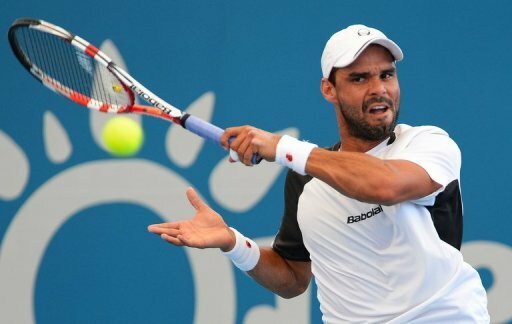 Colombia’s Alejandro Falla saved six set points in the second set to post a 7-6 (7/1), 7-6 (12/10) victory over Flavio Cipolla in the first round of the ATP Tour’s SAP Open. Falla needed two hours and 35 minutes to edge the Italian, claiming the win on his 10th match point overall. The world number 66, Falla now faces seventh seed Marinko Matosevic in the second round. In a battle of Americans, Michael Russell beat qualifier Donald Young 6-3, 7-5 in another first round match. Russell moves to the second-round where he will face two-time defending champion Milos Raonic, of Canada. Top seed Raonic received a bye through the first round. This will be the first career meeting between the 86th ranked Russell and the 22-year-old Raonic, who is ranked 13th in the world. Russell converted five of his six break points to improve to 4-1 against Young in their career meetings. Australian Matthew Ebden claimed his first win of the year as he beat qualifier Rik de Voest, of South Africa, 6-2, 7-5. He meets Xavier Malisse for a place in the quarter-finals. In other first round matches, American Steve Johnson rallied to beat Ivo Karlovic 6-7 (2/7), 6-4, 7-6 (8/6).